The U.S. Air Force's STP-S26 mission consists of four satellites (above) and three cubesats. WASHINGTON? The U.S. Air Force?s experimental STP-S26 mission is slated to launchtoday(Nov. 19) in an effort to demonstrate a myriad of new spacetechnologies,including a command and control system, atmospheric sensors, andsatellitedeployment and propulsion systems. Themission will be the 26th launched by the Air Force?s Space TestProgram, whichcoordinates launches for experimental payloads from across the U.S.government. Sevensatellitesencompassing 16 experiments are now fully integrated andencapsulated atopa Minotaur 4 launch vehicle counting down the final days until launchfromKodiak Launch Complex in Alaska, said Air Force Lt. Col. Tim Cole, themission?s launch vehicle program manager. Liftoff is set for 8:24 p.m.EST (0124 Nov. 20 GMT). Fourof the satellites are in the 180-kilogram class, about the size ofsmallrefrigerators, and three are cubesats weighing just a couple ofkilograms each. TheMinotaur 4 launch vehicle, built by Orbital Sciences Corp. of Dulles,Va., isbased on three repurposed U.S. Peacekeeper ICBM solid rocket motors andafourth stage powered by Alliant Techsystems? Orion 38 solid rocketmotor. Therocket made its suborbital debut in April, followed by its firstorbital missionin September. ThethirdMinotaur 4 flight will mark a number of firsts for therocket, Cole said ina Nov. 9 media briefing. This will be the first Minotaur 4 launch fromAlaska,and it will be the first to use a new multi-payload adapter plate, uponwhichthe four larger satellites are mounted. TheSTP-S26 mission also will be the first Minotaur 4 vehicle to deploypayloadsinto two different orbits. Therocket?s four conventional stages will carry it to a 72 degree inclinedorbit650 kilometers above the Earth, where all seven satellites will bedeployed.Then its Hydrazine Auxiliary Propulsion System will propel a dummypayload toan altitude of about 1,100 kilometers, where a new Boeing-developedpayloadseparation system will deploy the ballast, Cole said. 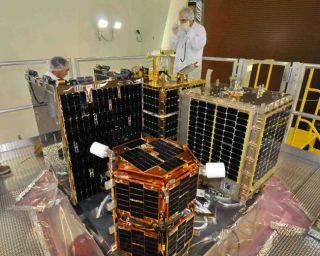 Theprimary payload for the STP-S26 mission is the STPSat-2 spacecraft,built forthe Air Force by Ball Aerospace & Technologies Corp. ofBoulder, Colo.STPSat-2 uses the first production version of the Space TestProgram-StandardInterface Vehicle, a 110-kilogram satellite platform designed to hostthemajority of the experiments considered for launch by the Space TestProgram,said Ken Reese, the Air Force?s STPSat-2 program manager. ?The[Standard Interface Vehicle] is ideal for science and technologydevelopmentmissions,? Reese said. ?We can accommodate up to four independentpayloads andlaunch on a variety of launch vehicles.? Thesatellite will carry two payloads: the Ocean Data Telemetry MicrosatLink,which will relay data from ocean and terrestrial sensors, and the SpacePhenomenology Experiment, which will evaluate sensor compatibility inthe spaceenvironment, Reese said. STPSat-2will be the first satellite operated by a new command and controlsystem calledthe Multi-Mission Space Operations Center at Schriever Air Force Base,Colo.The ground system is designed to fly multiple constellations ofspacecraft withvarious missions. Alsoon board the STP-S26mission is the first Fast, Affordable Science and TechnologySatellite ? orFASTSat ? built by 13 Huntsville, Ala.-based organizations, includingDyneticsCorp., the Von Braun Center for Science and Innovation, Marshall SpaceFlightCenter and the University of Alabama. Thesatellite was designed and built in less than 15 months and hosts sixatmospheric experiments, said FASTSat mission manager Mark Boudreaux. FASTSatis unique because it will be the first free-flying satellite to deployaseparate free-flying cubesat, Boudreaux said. Onceon orbit, FASTSat will eject NASA?s Nanosail D experiment, which aimsto be thefirst satellite to deploya solar sail for propulsion in low Earth orbit. Developed byMarshall andNASA Ames Research Center in Mountain View, Calif., the 10-centimetercube willunfurl a bed sheet-sized sail about as thin as a tissue that willpropel thesatellite as it catches photons from the sun. NanosailD will use its solar sail to deorbit itself, potentially demonstratinga newway to bring satellites and debris back to Earth without any chemicalpropellant, Boudreaux said. Theother two larger satellites on the STP-S26 mission are the UniversityofTexas?s Formation Autonomy Spacecraft with Thrust, Relnav, Attitude andCrosslink satellite and the U.S. Air Force Academy?s FalconSat-5spacecraft. Themission?s two other small satellites, which measure about 30centimeters by 10centimeters, are NASA?s Organism/OrganicExposure to Orbital Stresses craft and the National ScienceFoundation?sRadio Aurora Explorer craft.